To support business continuity, many organizations eagerly avoid putting all their eggs in one basket. 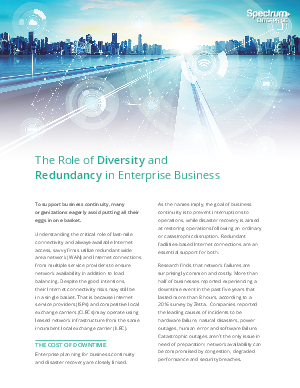 Understanding the critical role of last-mile connectivity and always-available Internet access, savvy firms utilize redundant wide area network (WAN) and Internet connections from multiple service providers to ensure network availability in addition to load balancing. Despite the good intentions, their Internet connectivity risks may still be in a single basket. That is because internet service providers (ISPs) and competitive local exchange carriers (CLECs) may operate using leased network infrastructure from the same incumbent local exchange carrier (ILEC).